Transportation Costs > How Much Does a Crash Test Dummy Cost? How Much Does a Crash Test Dummy Cost? For years, crash test dummies, referred to as an anthropomorphic testing device, have been used to test how much damage can be endured when a crash occurs. These dummies are usually wired with sensors, and during a crash test, the sensor can record the force of the impact caused by the crash. This information influences the way that cars are made and the safety features that are either required or included. Sine 1960, it has been said these “dummies” have saved more than 300,000 lives. 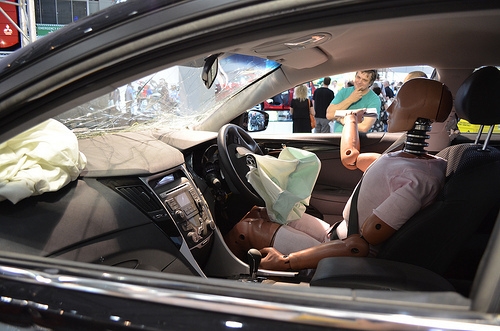 Depending on the technology used, the costs of a crash test dummy can greatly vary anywhere from as little as $100,000 to as much as one million dollars. Keep in mind that these are only created by larger car companies for their safety engineering department. Chances are, however, you will not find any for sale on the open market due to the cost to the manufacturer and proprietary technology. According to SmartPlanet.com, the price tag for the most sophisticated crash test dummy is more than half a million dollars. On the other hand, according to Road and Track Magazine, the most advanced newer models can cost at least $400,000. This USA Today article, published in 2014, talked about crash test dummies becoming obese and costing up to $500,000. Crash test dummies are created to imitate an actual family and can be made to simulate a variety of ages and sizes, ranging from a six-foot-tall 233-pound male to a five-foot, 105-pound female. There are dummies built to simulate children, toddlers, and even newborns. They can come in virtually any shape or size, but most of the time, a company will use a male or female that represents the 95th percentile. A crash test dummy can have around 70 to 80 sensors that detect how much and what kind of force is endured during a crash. Newer dummies can transmit data up to 10,000 times per second. With these sensors, engineers get the data from the physical tests and simulations conducted to understand how a new vehicle, its safety systems, and occupants respond to a crash. They then use the data to improve the way the car is made. Depending on its care, a crash test dummy can last up to 15 years, but newer models are said to last forever. Crash test dummies often include three main types of instrumentation: The accelerometers, the sensors that measure the acceleration of the dummy in a specific direction during an accident, the load sensors, which are the sensors used to measure the force of the impact to the different parts, and the movement sensors, which are the sensors are in the chest and measure how much the chest deflects in a crash. Trying to purchase a used crash test dummy is not a good idea. The dummy could have been damaged or it could have sensors that are not aligned or are no longer read correctly. There are two types of tests currently performed by the National Highway Traffic Safety Administration (NHTSA). The 35 MPH frontal impact, in which the car runs head on into a concrete wall, and the 35 MPH side impact test, where a 3000-pound sled, with a bumper, runs into the side of the vehicle.